Is that Frosty the Snowman I hear? Where has the year gone? 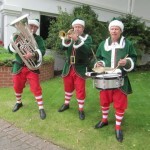 It was only yesterday that I was moaning about the boys in the band and White Christmas. Not much to report. I didn’t have a bet all day. But I managed a photo of an extremely rare quadruple gear combination. Index Linked had a tongue tie, Kineton noseband, nose roll and ear muffs. The horse was lolling its tongue as well. 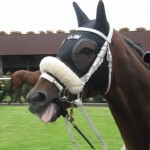 I like my horses to be cleanskins, but Chris Waller is certainly using ear muffs to great advantage. And lolling, which was neutral in the book, is now a positive. Index Linked streeted them. And I am very pleased to report that the first draft of Volume 2, Watching More Racehorses, is now complete. Hopefully, out for the spring. Lots of good stuff in it, including updates on things like ear muffs and lolling. All the best for a Cool Yule. Back in the New Year.